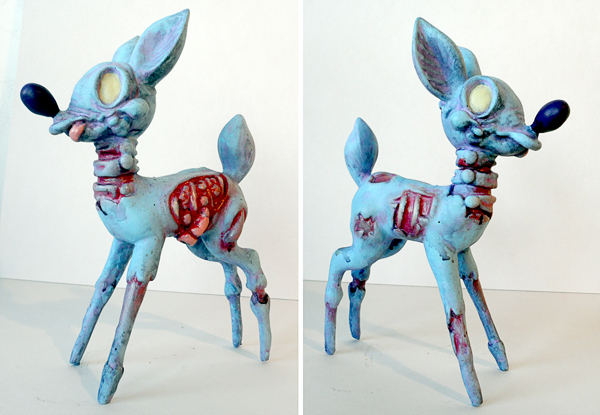 Previously on Calliope Jackalope, An Anatomy: Calliope is rendered in 3D and from that a prototype is made for the factory to map out the mold process. We head there now for some mold-makin’, waxin’ action! 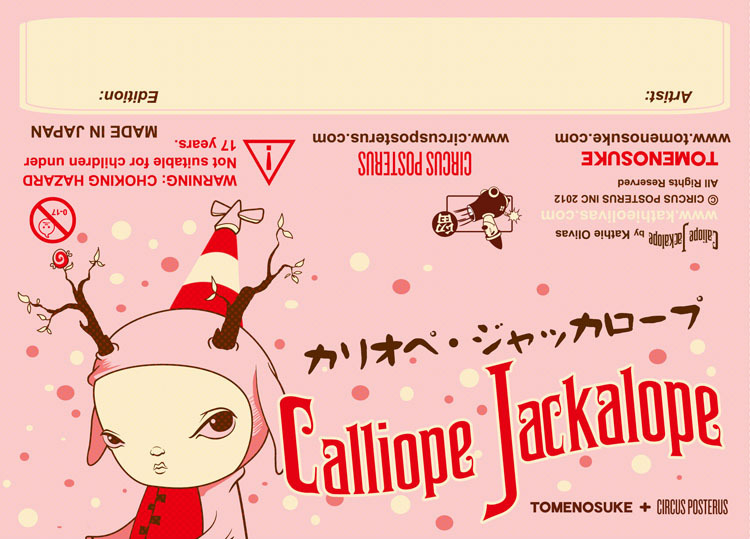 Like Stingy Jack, the Calliope prototype was taken to Obitsu to determine how many metal molds the figure will require. Given her complexity, she, too, would require five to cover her multiple parts: head, body, legs, hat, ears and tail. And from there, the header card art is submitted by Brandt and Kathie and voila! 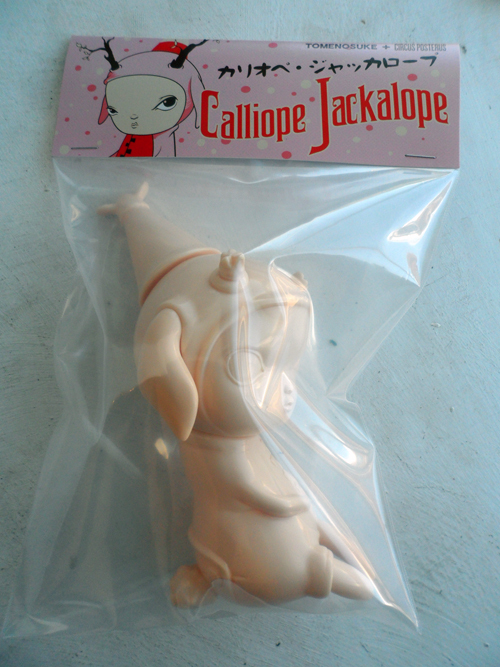 Our first packaged Calliope! Mikee’s Mail Day: Monster Kolor!! This week’s mail day is brought to us by the amazing, unstoppable beast known as Monster Kolor! 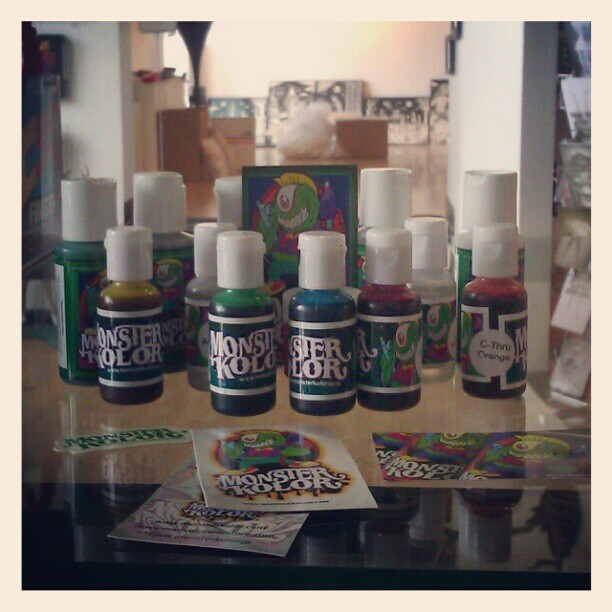 Monster Kolor is a company that lives to make the best paint they can for toy customizing, be it vinyl, resin, PVC … whatever your little twisted heart desires. 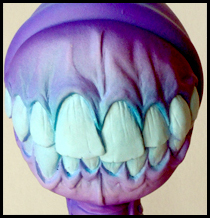 Recently I picked up some Monster Kolor for my airbrush gun so I could do a little recreational custom work. I’m getting the hand sharp for some projects in the works and have to be able to do “gruesome” just right! Don’t think it’s all airbrush though; they also carry brush and aerosol paints to help give your creature just the right finish or feel. When it came in Brandt and Kathie made me promise not to sit in the house and spray it. Also they said I have to wear a mask while I do it from now on … safety first kids! Until next time, live that 24/7 Toy Life! After years of designing characters and toys brands for Slap-Happy!,The Serv-O-Matics, Dead Bunny, The Carnies, Big Sal, and other odds and ends with almost every toy company out there, I went back to the drawing board to really consider what I was trying to accomplish and say with my characters. The public only gets to see the final result in the stores or online, but each of the above projects were months and years of my time developing and it takes a lot out of me. In order to stoke and keep the creative fire going strong, I had to reach even deeper and closer to mine and my creations’ raison d’etre. Following a month or so of scribbling, note taking, researching, talking to my colleagues and friends, reading the industry – I reached in and figured exactly what my inspirations are, who I am and precisely what I want to leave, as far as a mark on the planet and this toy world. 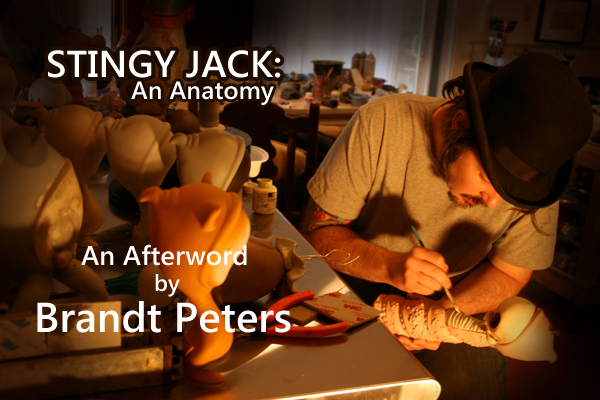 Stingy Jack is the first project (of many in development) that hits closest to home. I guess as a growing artist, my tastes change, I get more honest with myself, I hone in closer and closer to what makes me tick and Vintage Halloween has always thrilled me… just as much as all of my other toy subject matter: Ancient Aliens (Big Sal), Coney Island and Depression era ephemera (most of my toy designs to date). Barrelling right along with our Carnival countdown, Day 3 brings a long awaited treat: Dark Wippo from Teodoru Badiu and Circus Posterus. Yes, the wait is finally over: this colorway will debut at Le Carnaval des Spectres next week! 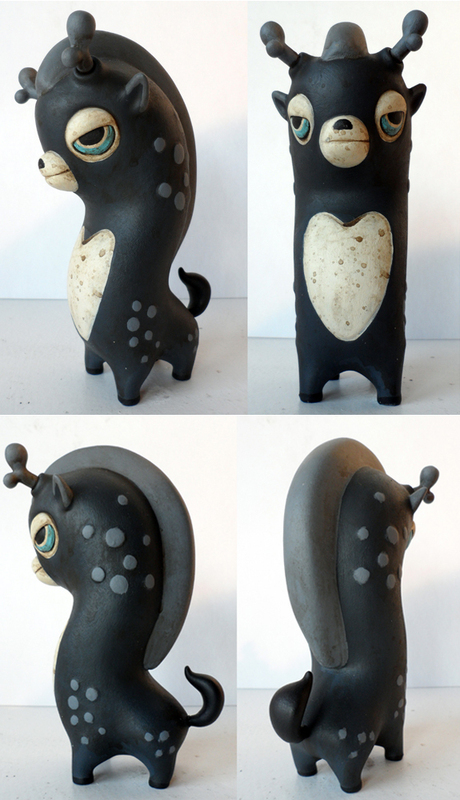 Conceived by Teo and produced/painted by the CP gang, Dark Wippo is 4- to 5-inches of solid resin (the weight will surprise you), and an edition of 30 pieces. Five will be on hand at the exhibition, with the rest releasing later (eyes on the forum … you know the drill!). This undeniable cuteness retails for $135. A few days ago, Travis Louie gave us a taster of a couple Stan Skelves that he was working on for Le Carnaval des Spectres, opening next Thursday at Artoyz Paris. Well, damn, when Travis promises Stans, we get Stans: a whole Brady Bunch of ’em! 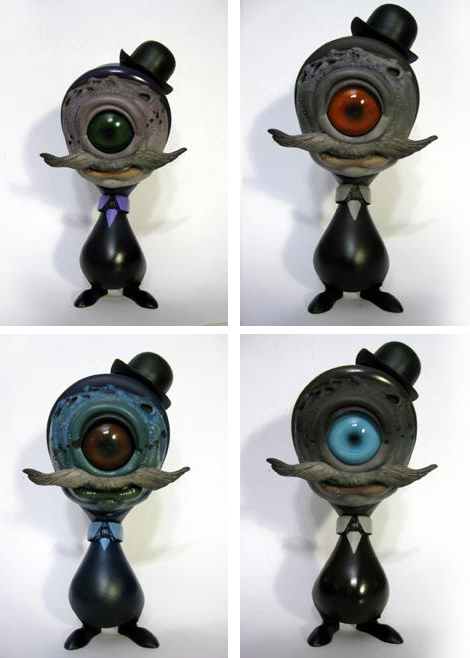 Each of these dapper gents are one-of-a-kind and handpainted by Travis. They’ll retail for $950 each. 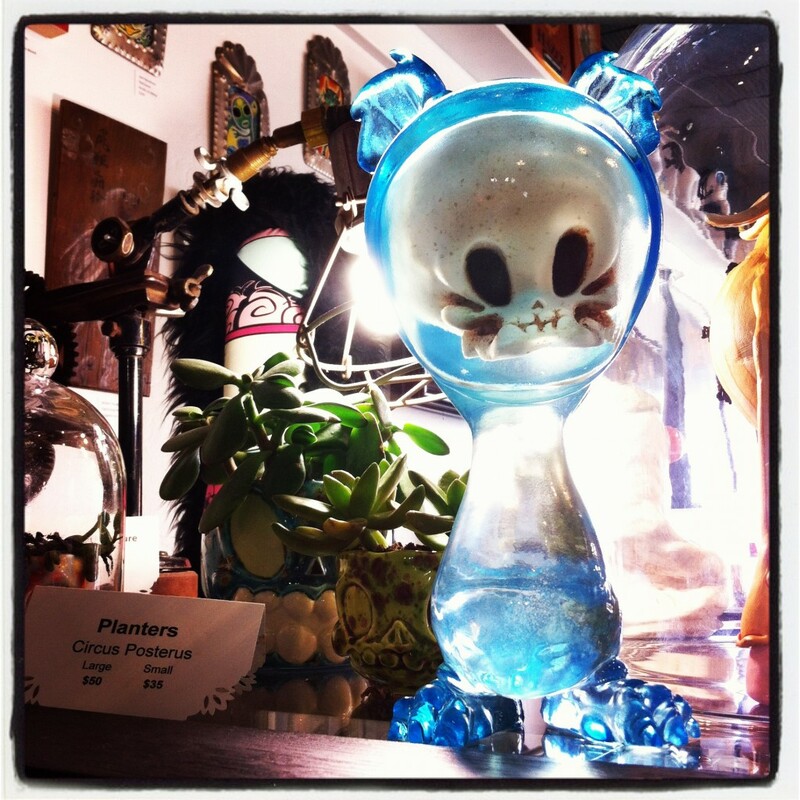 Le Carnaval des Spectres opens Sept. 13 through Oct. 20th at Artoyz Shop + Galerie in Paris, France. 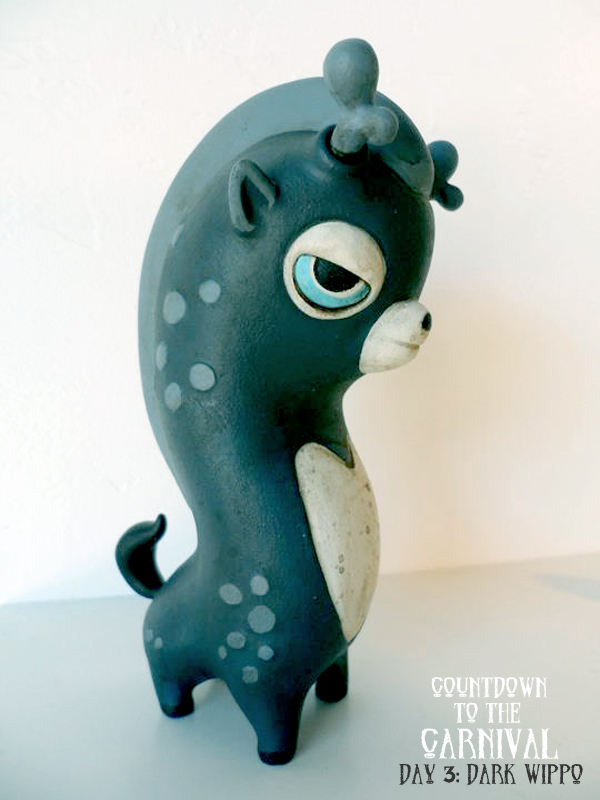 The exhibition marks CP’s first group exhibition on European soil and features a collection of new two- and three-dimensional works from Kathie Olivas, Brandt Peters, Travis Louie, Chris Ryniak, Amanda Louise Spayd and Teodoru Badiu. Kathie wrapped up the beautiful “Shadow” Calliope Jackalope a couple days ago and admittedly, I’m sort of grateful … these little ladies have been teasing me for months; they’re mesmerizing and even more so in person. And as I’m sure you’ve noticed, they’re in good company with a few Grieving Greeters and Dark Wippos, which we’ll talk about very soon. And then there’s Brandt’s final figure, which quite honestly bombed my inbox earlier this week. It’s freaking awesome, gang, and I don’t even know if I can share it. It’s all insane and Kaiju style and painted with a freaking airbrush. Aw hell, I’ll give you a teaser. BUT THAT’S IT! 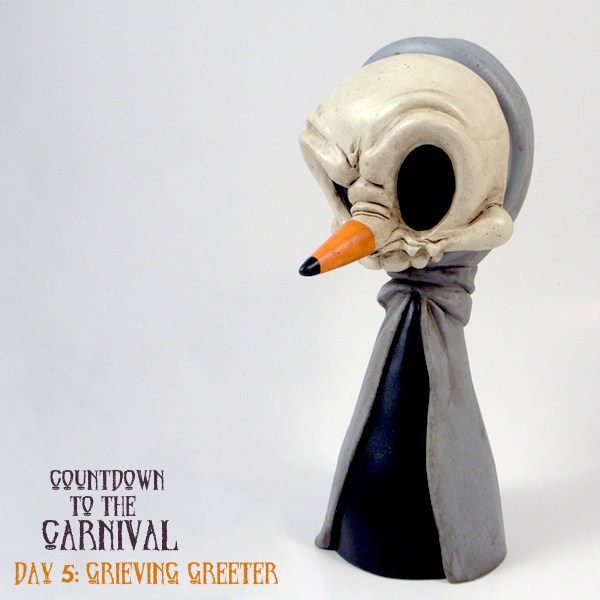 … Did I mention it’s a collaboration with Chris Ryniak? And just wait; this guy gets even better. Alas, I can say no more (and if you don’t hear from me tomorrow I’ve been fired :D). 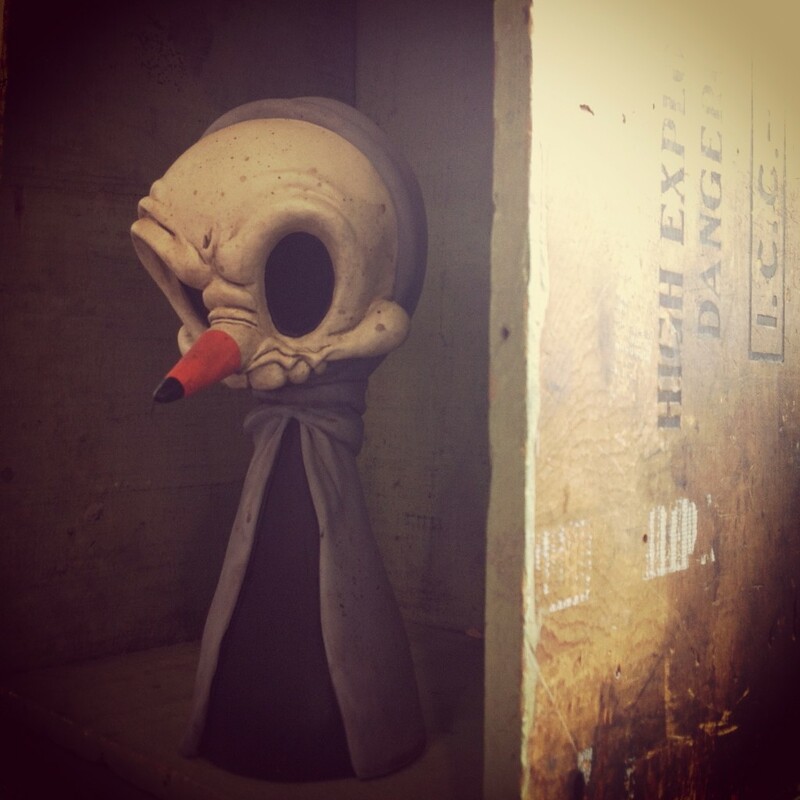 Almost all of the custom figures for this exhibition have remained a secret, lurking in the depths, eagerly awaiting opening night. Stay tuned … the curtain will be up before you know it. 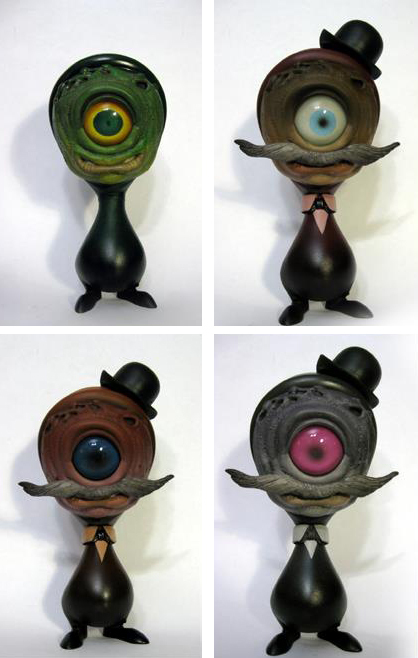 Le Carnaval des Spectres opens Sept. 13th through Oct. 20th at Artoyz Shop + Galerie in Paris, France. The exhibition includes new works from Kathie Olivas, Brandt Peters, Travis Louie, Chris Ryniak, Amanda Louise Spayd, and Teodoru Badiu. 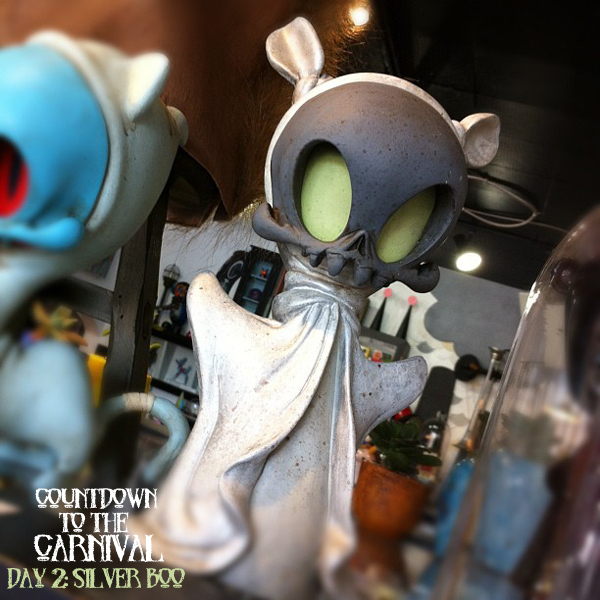 For Day 2 of our Carnival countdown, Boo is BACK and looking better than ever in a shimmering silver colorway. 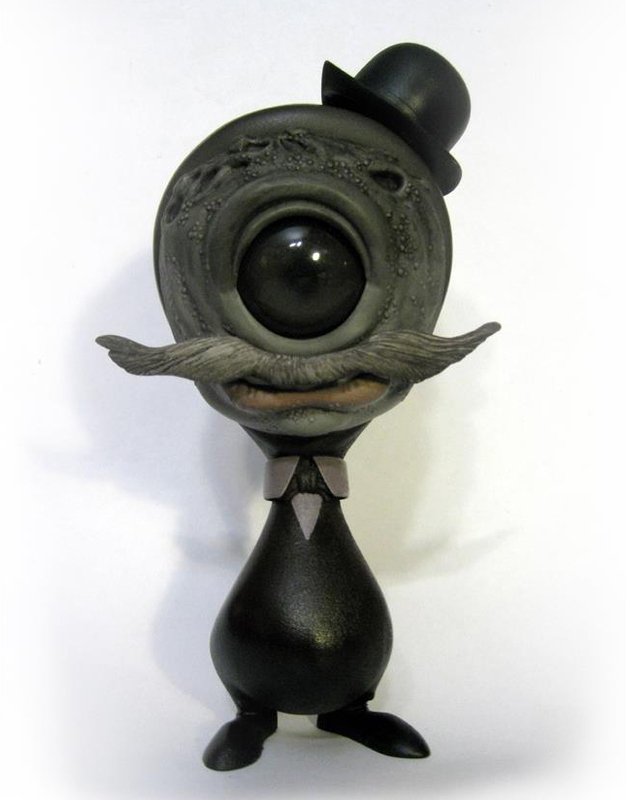 Following suit with his Fantôme fleet, Boo’s packing a pair of brilliant GID eyes, framed by a charcoal “niblet” mask. His robe is metallic silver with antique accents. It’s all swoon here, folks. A full, 66-piece run, Silver Boo will debut exclusively as part of Le Carnaval des Spectres. Five will be available at the exhibition and the rest will be sold online with the Paris packs and forum lottery (leftovers will be put up in the shop if necessary). He retails for $265. Step right up! Step right up, now! With the opening of Le Carnaval des Spectres mere days away, we’re offering folks a sneak peek at the fresh-from-the-grave, newly-reanimated and flat-out spooky editions that will emerge from the Circus caravan next week at Artoyz Paris. 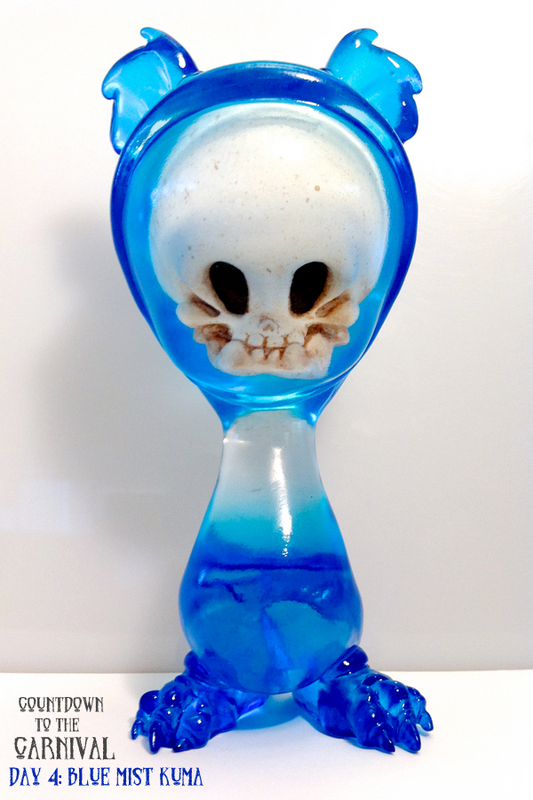 First out of the gate is guts and gore galore from Brandt Peters, as he debuts his highly-anticipated Fantôme Zombambies. 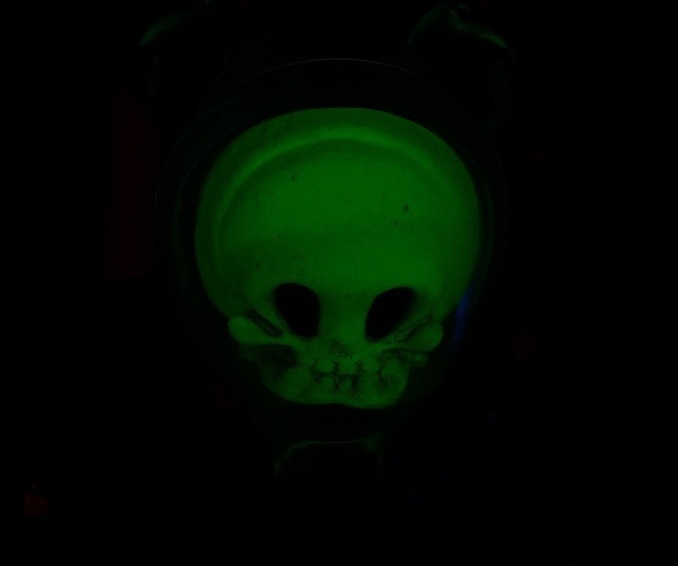 Initially released as a handful of candy-themed customs for Monsters & Misfits II, the herd returns as a slightly stinkier, unappetizing, but equally badass spectre edition. Entirely handpainted by Brandt with acrylics, these resin beasties have GID eyes that bring chills when beneath a blacklight. 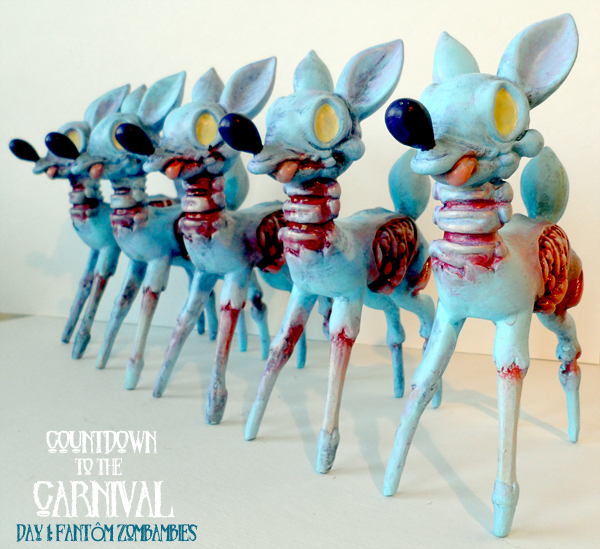 The Zombambies are super limited edition of 20, with five heading to Paris and the rest will be divvied up between CP forum members and a lottery (if applicable). They retail for $300 a head (intestine, spinal column, etc…). Tomorrow the ghastliness continues with the long-awaited return of a fan favorite. So stick around — we’re just warming up!